Can the Server Generate IP Streams Simultaneously with the Output SDI Signals? Yes, absolutely. SL NEO server software resources can generate UDP/RTP Unicast/Multicast MPEG-2/H.264 streams: the resolution and compression parameters may be configured, you may install a board that supports FEC, if needed. UDP streams may be sent to Wowza Media Server, if necessary. There is also a possibility of integration with Adobe Flash Media Live Encoder: to do this, SL NEO software uses the module of the virtual output device that sends an uncompressed stream to the program encoder Adobe (the coder is installed locally and generates the RTMP stream). 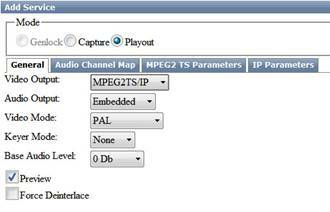 How to Adjust IP Broadcasting to the Network? By the right click on the blue icon SL NEO in the taskbar, choose Stop Server and stop the server components. After some time the icon will change its color to red. Right click on it and choose the item Configure Server Components. 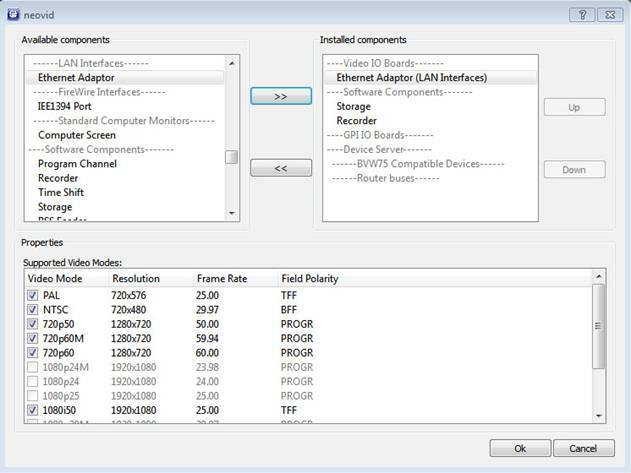 In the setting window, find the field Available Components and add the element Ethernet Adaptor to the right field (it will generate UDP/RTP streams). After the login to the control console, choose Manage at the left menu of the console. Choose the tab Video IO Boards, click Add Service in the window Ethernet Port. Choose Mode - Playout in the appeared window, set the needed value Video Mode in the tab General. Now let’s pass on to the tab MPEG2 TS Parameters. Find the tab Output and specify the total output flow rate in the field MUX Bitrate. 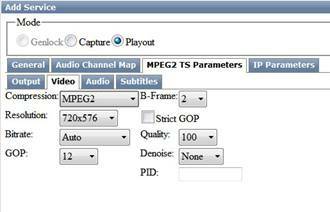 In the itemVideo choose the encoding algorithm - MPEG2 or MPEG4/AVC (H.264), set the resolution parameters; you may leave the speed of a video stream in the mode Auto. Then you should specify the encoding parameters or leave the default settings. In the tab Audio you should enter the parameters for encoding the audio track or leave the default settings. Let's pass on to the item IP Parameters. In this tab you can choose the broadcasting protocol (UDP or RTP). For generation of the unicast IP-traffic, enter in the fieldAddress the IP address and port of the machine that will receive the stream. For generating the multicast IP-traffic, enter in the field Address the IP address from the range 224.0.0.0 - 239.255.255.255 and the port. In the field Multicast IF you should specify the physical IP address of the network adaptor of the backup server, from which multicast-traffic will being formed. The parameter TTL – Time To Live (time of life for the batch) defines the number of routers that the batch can pass through. The batches with TTL=1 may be transmitted only within one subnetwork. So we’ve configured the basic parameters: press Apply at the top part of the control console window to apply changes. Find the item Manage in the control console and choose the earlier configured service Playout that is fixed to the network adapter and is responsible for generating the IP stream. Send the stream from the output of the service for generating the program channel Program_1 (or choose the needed source from the list) to the service input (field Input). You can check if the settings are correct with the help of VLC Player. To receive the UDP unicast stream, enter "udp://@:port" in the VLC settings of the receiving side. To receive the UDP multicast stream, enter “udp://@multicast_ip:port” in the VLC settings of the receiving side. Besides, if the server generates the stream in the Unicast mode, you can connect to it by RTSP. To implement this, use the URL:rtsp://server_ip:8554/<service_name>. 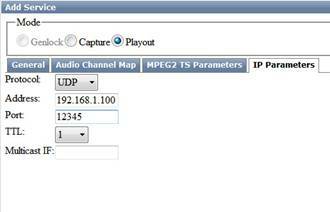 If the IP playout service has the name Playout_1, you should enter the URL: rtsp://server_ip:8554/Playout_1 to the VLC settings of the receiving side. · In the tab Manage of the control console you should choose the configured Playout service that is fixed to the new device; send the stream from the output of the service for forming the program channelProgram_1 (or choose the needed source from the list) to the input of the service (the parameter Input). · When the server is in work, you may use the programs that support Direct Show and choose the devices with names SL NEO Video Capture and SL NEO Audio Capture as sources. All virtual devices of the SL NEO platform were checked on return of a stream in Adobe Flash Media Live Encoder (FMLE).